As McGill prepares to celebrate half a century of research excellence in epidemiology, biostatistics and occupational health, it has announced the creation of the Albert Boehringer I Chair in Pharmacoepidemiology, made possible through a $3 million gift from Boehringer Ingelheim (Canada), Ltd.
Bridging the disciplines of pharmacology and epidemiology, pharmacoepidemiology examines the use and effect of drugs to assess their overall benefits, as well as possible adverse effects, for defined populations. 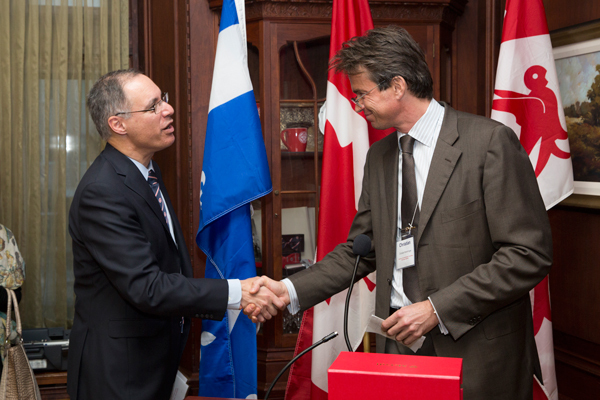 Establishing a Chair not only gives McGill’s Faculty of Medicine the means to fund a world-class scholar in the field, it also will help attract new, talented students and fellows to pursue research leading to improved treatments for diseases. “We thank Boehringer Ingelheim for this very generous gift, which will enable McGill to continue to build the necessary capacity and research excellence in this important health sciences field,” said Principal Suzanne Fortier. The Albert Boehringer I Chair in Pharmacoepidemiology is named in honour of Albert Boehringer I, who founded Boehringer Ingelheim in Germany in 1885.